Microsoft CEO Satya Nadella is under fire for his comments about working women, in an industry that already has a reputation as being woman unfriendly. During the Grace Hopper Celebration of Women in Computing conference in Phoenix, Nadella was asked his advice for women who are uncomfortable asking for raises or putting themselves up for promotions or advanced opportunities. “It’s not really about asking for the raise, but knowing and having faith that the system will actually give you the right raises as you go along,” Nadella said. “That, I think, might be one of the additional superpowers that, quite frankly, women who don’t ask for a raise have. Because that’s good karma. It’ll come back because somebody’s going to know that’s the kind of person that I want to trust. That’s the kind of person that I want to really give more responsibility to. And in the long-term efficiency, things catch up. 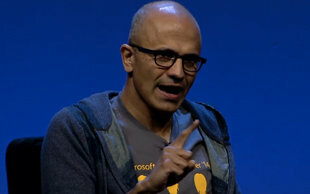 See Nadella’s comments here, starting at the 1:35:05 mark. When Nadella’s interviewer, Dr. Maria KlawePresident of Harvey Mudd College, a computer scientist by trade and a member of Microsoft’s board of directorspolitely responded, “This is one of the very few things I disagree with you on,” the crowd applauded. Microsoft recently released its workforce demographics, revealing that the company’s global workforce is just 29 percent women. In tech positions, the number drops to 17.1 percent. Moreover, only 17.3 percent of Microsoft’s “leadership” positions are held by women. This compares with a U.S. workforce national average (Catalyst data) of 29 percent, a DiversityInc Top 50 average of 29.3 percent, and a DiversityInc Top 10 average of 32.3 percent. Other tech companies that had fought for years to hide their workforce demographics started to finally release them publicly earlier this year, and most had roughly the same female representation as Microsoft. Google’s global workforce includes just 21 percent women, while 30 percent of Apple and Twitter‘s employees are women, 31 percent of Facebook‘s and 37 percent of Yahoo!‘s workforce. Amongst leadership, all of these companies are also grossly underrepresented by women, but still outperform Microsoft (Google and Twitter: 21 percent, Yahoo! and Facebook: 23 percent, Apple: 28 percent). When it went public earlier this year, Twitter’s entire board of directors were white men, and only one woman was counted amongst their investors and executive officers (Vijaya Gadde was hired as the company’s general counsel just two months before the IPO release). This is all the more shocking when you consider that women earn more than half of all college degrees in the United States, including 62 percent of associate’s degrees, more than 57 percent of bachelor’s degrees, nearly 63 percent of master’s and more than 53 percent of doctoral degrees. Tech companies, or companies with strong STEM (Science, Technology, Engineering, Mathematics) workforce components that emphasize gender equity, have more inclusive cultures and better human-capital results, DiversityInc Top 50 data show. For example, Novartis Pharmaceuticals Corporation, No. 1 this year in the Top 50, has worked hard to improve gender equity in critical jobs. Christi Shaw, President, now has women in scientific functions as more than half of her direct reports. Later this week, a story on DiversityInc Best Practices will detail how Top 50 companies with strong STEM workforcesincluding IBM, BASF and Monsantoare hiring, retaining and promoting more women in technical jobs. Research by Harvard University Professor of Economics Claudia Goldin shows that women in computer engineer, scientist or programmer jobs make anywhere from 84 percent to 90 percent of men in the same position, controlling for age, race, experience and education.